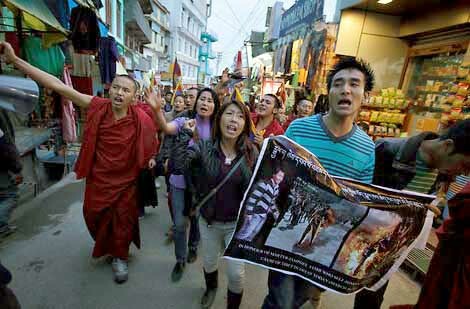 Dharmshala : Tibetans living-in-exile held a large protest in Dharamsala on Saturday demanding an independent probe into the death of a monk, Tenzin Delek Rinpoche, who died in Chinese custody. Monks, political activists, and foreign nationals participated in the fifth day of protest, asking the United Nations to put pressure on China to investigate the death of Rinpoche. Vice president of the Gu-Chu-Sum (Tibetan Political Prisoners Movement), Namgyal Dolkar, called for an independent investigation inside Tibet. "We request the United Nations and every government around the world to organise an independent investigation inside Tibet so that we can find out about the murder of Tenzin Delek Rinpoche," said Dolkar. Yeshi Phunstok, a member of Tibetan parliament-in-exile, said the cause of Rinpoche's death was unclear. "The reason was not clear there, so people of the world and Tibetan community asking to find the fact why he expired. He was imprisoned for a long time-almost 13 years," Phunstok said. Rinpoche died on Sunday in Chuandong prison in the southwestern city of Chengdu. The Tibetan government-in-exile, the Central Tibetan Administration, also confirmed his death. The United States, the European Union and international rights groups had called for the release of the 65-yeard-old, who was serving a 20-year sentence on charges of 'crimes of terror and incitement of separatism'.